Tweet Yesterday I posted part one of my write-up of my recent London trip, talking about Saturday 16 March, and the entry was getting a bit long so I decided to split it in two and put the events of Sunday 17th into a separate entry. Sunday saw us check out of our hotel and take a trip along the District line back to old London to visit the Tower, one of the five Historic Royal Palaces in the city. I'd been to the Tower a couple of times before, the last time about four years ago, but Gemz had never been and wanted to see the Crown Jewels. 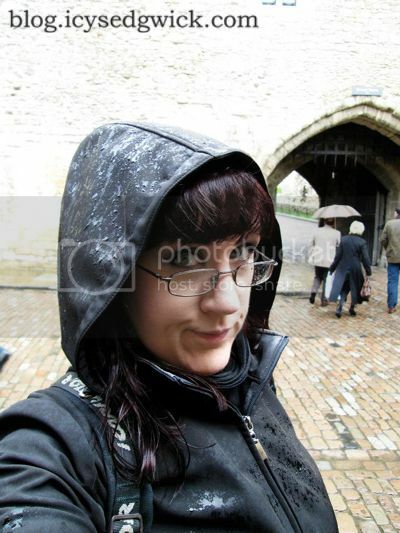 As you can see, I wasn't particularly impressed by the damp and drizzly weather, and I was just glad I'd taken my raincoat with me! I think I had hoped that the poor weather might put people off venturing out of doors, but the Tower was really busy, and the continual rain meant that all of the indoor attractions were rather full. The Jewel House in particular was very busy, although I can't help thinking the mammoth steel doors are a better indication of royal might than the impressive range of royal plate and jewelled ephemera on display. It's a good job they have a moving walkway in front of the crowns, otherwise you'd never be able to get anywhere near them! The Tower of London was founded in the latter half of 1066 after the Norman Conquest of Britain, and only Tower Hill separates it from the eastern boundary of the City of London. It's been used as both a royal palace and a prison, not to mention a symbol of royal power, and various monarchs have added different towers and functions. 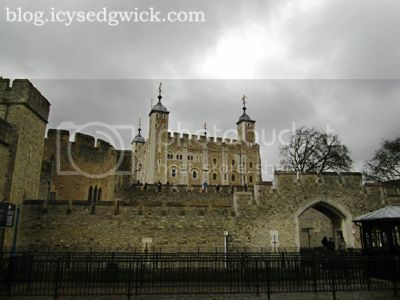 It used to house the Royal Mint and the treasury, as well as a Menagerie, and currently houses the Crown Jewels in the Jewel House, as well as the Royal Armouries in the White Tower. It also houses seven ravens, due to the legend that says if the ravens leave, the Tower will fall. The Royal Armouries in the White Tower contain both the weaponry belonging to individual monarchs, such as Charles I's suit of armour and an articulated suit of armour for the thirteen year old Edward VI, as well as those weapons etc. that have been donated as gifts over the years. For example, they have a suit of samurai armour dating back to 1610. 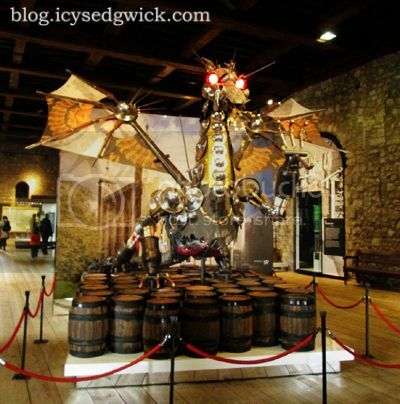 We came across this particular display, where a range of weapons and other items, were turned into a gigantic dragon. It was rather steampunk in its own way, and I couldn't not take a photo. I've been trying to find it online to see if there's a particular reason for its being there, but I can't find anything, so I don't know if it signifies anything, or a curator just got bored and wanted to do something a bit different with one of the displays. One of the displays is of weapons as art, and I couldn't not take this photo! 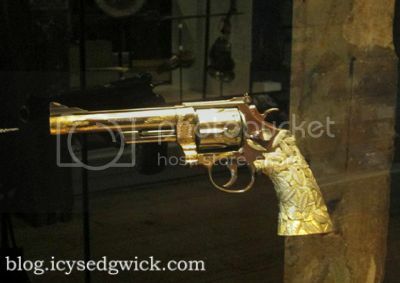 Apparently the legendary US gunsmiths Smith & Wesson donated this revolver to the Royal Armouries in 1989. The Trustees of the Armouries commissioned Tiffany & Co. to decorate it as part of their policy to commission and collect fine craftsmanship. The decoration features leaves representing five different woods used in gun-making. They did also have a couple of other guns but they were a bit too 'bling' for my liking. 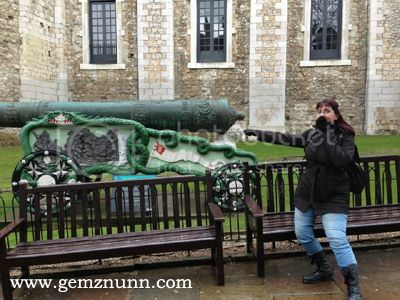 This is me faffing about outside the White Tower, pointing at a rather large cannon. I pinched this from Gemz, which is why I've tagged it with her web address instead of mine. (Give her website a look if you need to employ a web ninja!) As you can see, I have no problem with posing like an idiot in photographs, especially where heavy weaponry is involved. I think the rain had briefly stopped by this point, but the day was still somewhat dull and overcast. Still, we're Northerners so we're used to crap weather. All I can say is at least it wasn't snowing! One of the strange things about the Tower is the fact it was once this imposing symbol of royal power, and it's now been dwarfed by the rest of modern London, now nothing more than a tourist attraction on the banks of the Thames. 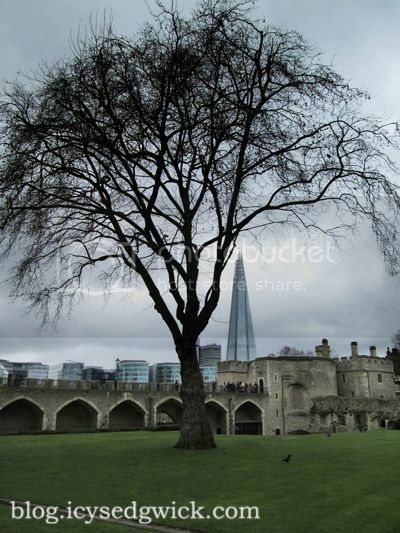 I took this photo from beside the south east corner of the White Tower, looking across the inner ward towards the Shard on the southern side of the Thames. The little black dot on the lawn to the right of the tree is one of the Tower's famous ravens, having a bit of a wander. While inside any of the buildings, you really do get a sense of the age and history of the place, but the second you get outside, the skyline is dominated by the hideous glass monuments to commerce that seem to have sprung up all over London. I suppose it's one of the signs of modern life, and perhaps I'm just too much of a traditionalist, but I really do prefer the 'historic' parts of London, as opposed to those glittering modern areas. 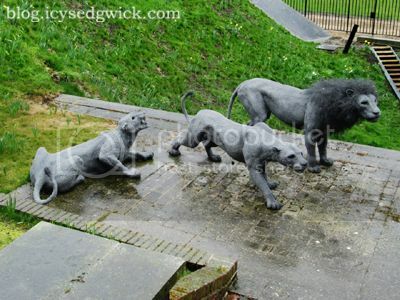 All over the Tower they now have these wire sculptures of various animals by Kendra Haste - we spotted lions, an elephant, a polar bear, a leopard and monkeys, all testament to the Menagerie that the Tower had between 1251 and 1835. No one actually knows where the Menagerie was kept, although the lions were kept, somewhat unsurprisingly, in the Lion Tower. The Menagerie was originally for the benefit of the monarch, and visiting royalty often gifted animals to join the Menagerie, but it was opened to the public in the seventeenth century. It was moved out to a site in Regent's Park in the nineteenth century, where it became London Zoo. 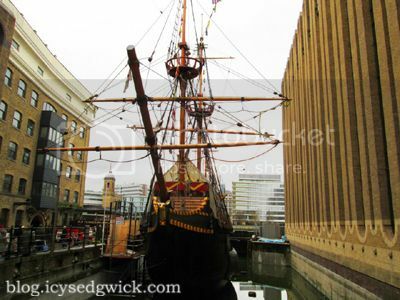 After the Tower, we crossed Tower Bridge, and took a walk along the South Bank towards the Tate Modern, passing Southwark Cathedral, Borough Market, and this, the Golden Hinde II in Pickford's Wharf. It's a replica of Sir Francis Drake's famous vessel, and while I've been on the original in Brixham, I've never been on the replica. It's something of a favourite for children's pirate themed parties (well Drake was a privateer, which is pretty much a polite way of saying he was a State-sponsored pirate) and there was one going on as we went past. 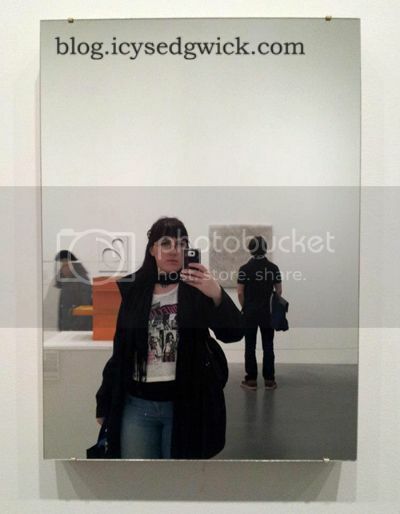 Here's me posing with an example of knitting in the Tate Modern, so really, if it's in an art gallery then it must be art...right? I've been campaigning for knitting to be considered art for a while! This is an example of tubular knitting, done on double pointed needles, and I think this one was done using nylon. That would absolutely wreck your fingers, but it certainly looks good It's actually Untitled by Marisa Merz, from 1969, and is in the Energy and Process gallery. I think knitting IS an art but it is also a process, and a very valuable one, so it was nice to come across something representative of my hobby in an art gallery. 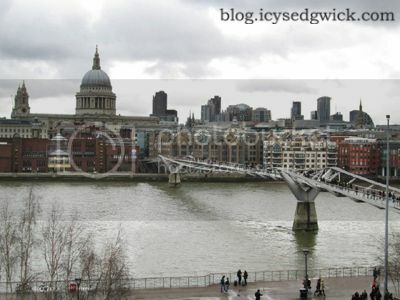 Here's the view of the Millennium Bridge from the viewing platform of the Tate Modern. Obviously that's the extremely distinctive dome of St Paul's Cathedral that you can see beyond all of the other buildings. The London skyline never fails to amaze me - Newcastle's is naturally somewhat smaller, and given our city centre stretches up a hill from the Quayside, our skyline is a bit more 'staggered', whereas the flat expanse of London gives you a good idea of its scale. I do quite like the Millennium Bridge, and if you've seen the Harry Potter films, you should recognise it. You are now entering the City of London...here be dragons! One of the weird things about London is that it's actually two cities for the price of one. The City is the square mile (well, 1.12 square miles) in the east that contains the likes of the Bank of England and Guildhall, and the area around it is Greater London. Boris Johnson might be Mayor of London, but the City has its own, the Lord Mayor of London, who holds office for a year. The City is pretty much the site of Londinium, and is therefore the oldest part of town, and the London Wall used to originally mark its boundaries. There are only fragments of it left, making it pretty useless as a wall, and I love the fact that they now use silver dragon statues to mark its boundaries. The dragons also appear on the City of London Corporation's crest, and some people think they refer to the legend of St George. 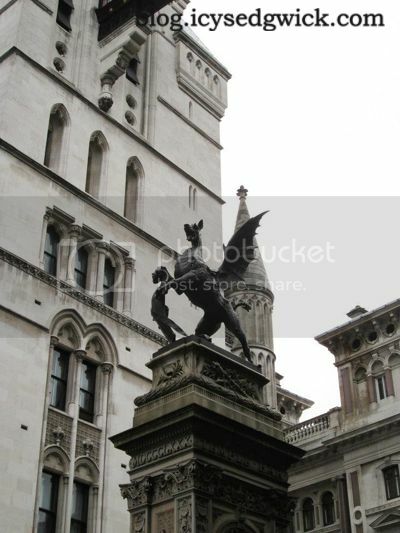 This particular dragon marks the boundary between the City of London and the City of Westminster, and stands outside Temple Bar. We walked along Aldwych from here to reach Somerset House, the palatial building on the north bank of the Thames where they now hold London Fashion Week. I'd only ever been in the courtyard before, and it's home to various gallery spaces, as well as the Courtauld Institute and part of King's College. 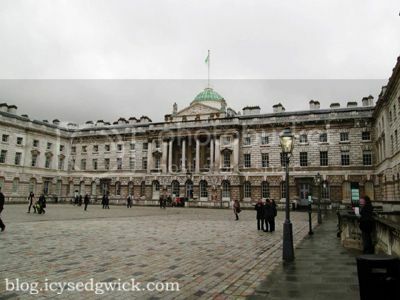 Other royal palaces have stood on the site for centuries, but the present Somerset House was built in the late 1700s/early 1800s as a public building for organisations such as the Admiralty. It was even the home of the Inland Revenue until a couple of years ago. This was one of the exhibitions that was on, the Wool House expo for the Campaign of Wool. Considering Gemz and I are both very keen knitters (and I've recently taken up crochet), we couldn't very well not have a look around, especially since it was almost finished as an exhibition (it actually finished on Sunday). The Campaign for Wool has HRH The Prince of Wales as a patron, and it's a global community of sheep farmers, retailers, designers, manufacturers and wool users who want to educate people about the benefits and versatility of wool. There's a real push to make the wool industry big again to help those small businesses and local farmers that depend on it. 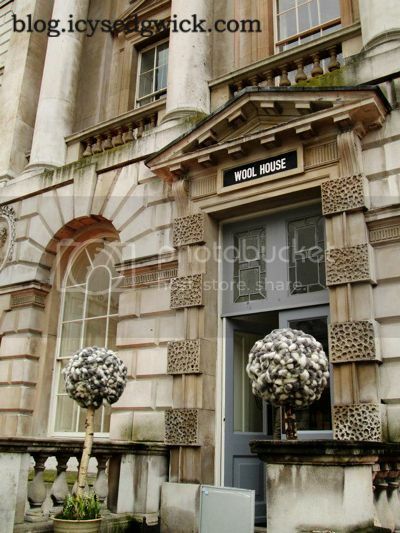 Wool House was the world's biggest celebration of wool, and contained all sorts of yarn-related delights, from rooms decorated entirely with woollen products, to educational events and workshops. They also had rooms dedicated to wool in the fashion industry, including shoes by Vivienne Westwood that I would kill to own*! *Not really. 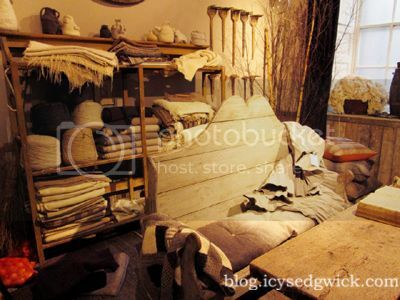 This is one of the rooms on display, and I'm determined that I will one day have a room like this in a house I own, with rustic wooden furniture and plenty of fabric and wool to hand. This is the Natural Room by Josephine Ryan, and she's created a room with naturally coloured yarns, coarse textures and layers. Other rooms in the exhibition featured interiors for modern living rooms, children's nurseries and entrance halls. If wool was a cheaper fabric, I'm sure I'd try and use a lot more of it at home! It was certainly a very inspirational exhibition and had me itching to reach for a ball of yarn and a pair of needles. 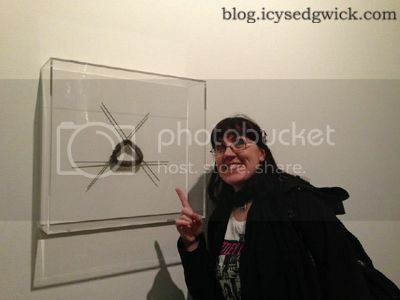 The other thing we saw was the Positive View Foundation's exhibition, Landmark: The Fields of Photography. 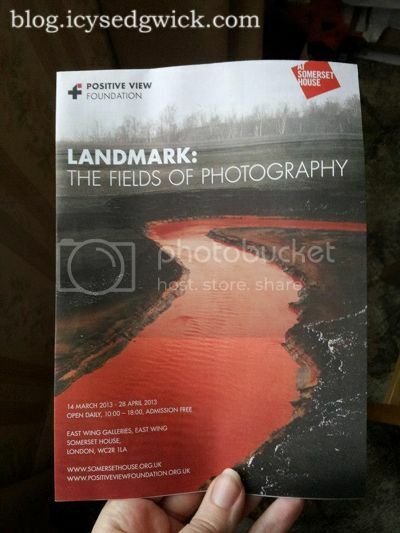 It's on until 28 April and it's FREE so if you're in London and you like photography, I really recommend it. It's a huge exhibition, and knocks the stuff at the Tate Modern into a cocked hat. It features work by photographers from all over the world, with the common theme being that of landscape. It's not all digital work, either - some of the photographers have used 19th Century techniques involving plate photography, while others have used drones and satellites to capture their images. The exhibition's curator, William A. Ewing, says that “landscape has been and remains one of the most powerful forms of photography, and is even more so in a world which is changing so fast we can hardly keep up" and you get the feeling that the only way you'll be able to see a lot of these landscapes is through exhibitions like this, because the landscapes are either totally inaccessible, or on the brink of destruction. Gemz and I travelled down on Friday, and we were staying in the Gloucester Road Holiday Inn. 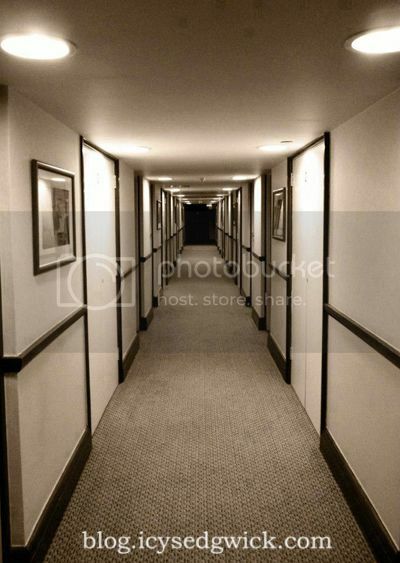 How's this for a creepy corridor? I put the photo on Instagram and a lot of people had visions of the Overlook. We were also amused by a 'what to do in an emergency' sign that included the line 'Do not panic'. Well that's us told, isn't it? What made the corridor especially weird was how low the ceiling is - I'm only 5ft 6ins and even I felt like I was having to duck. Anyway. The whole reason I'd wanted to go down was for the Doctors, Dissectionists and Resurrection Men exhibition at the Museum of London up in Barbican. 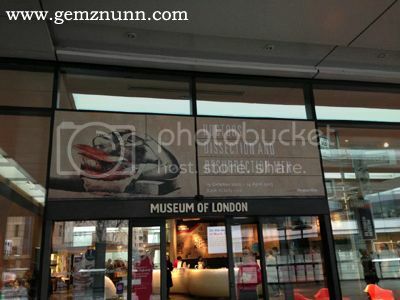 (We couldn't take photos in the exhibition so Gemz took this photo of the sign in the entrance). It was a fascinating exhibition, split into three areas. Bodysnatching came first, along with the tale of London's own bodysnatchers, known as Burkers (named after Burke and Hare). The bodysnatchers operated in the years prior to 1832, when bodies for anatomy lectures were scarce and difficult to come by through legal means. The next part of the exhibition was dedicated to the doctors, followed by the art of dissection. It was an interesting exhibition, featuring skeletons uncovered during excavations at the Royal Hospital in Whitechapel, and it left you aghast at the practice at bodysnatching, but aware that without such sordid acts, medical science might not have advanced the way that it did. The Museum of London is a fascinating place to visit, telling the story of the city from its prehistoric origins, through its occupation by the Romans, and then through the Plague, the Great Fire, the War, and on into the Sixties and Seventies. 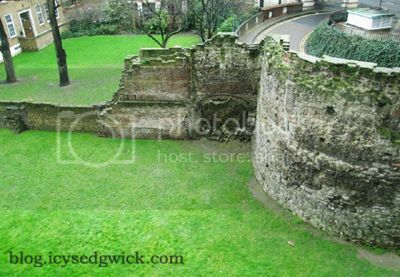 There isn't much evidence of London's medieval past, let alone anything earlier, and much of their Jacobean architecture has even been demolished, but the museum does afford a good view of a section of London Wall, part of the defence wall built by the Romans to protect Londinium. Apparently the wall dates to the late second or early third century, between 190 and 225 AD. Next up was the Science Museum, where I wanted to see an exhibition on alchemy (as you do). We also visited Google's Web Lab, where they were running various experiments where visitors could try out things in the exhibition, and other experiments were controlled by online users. It was predictably busy, and half of those experiments available for use within the museum seemed to be out of order, though I'm not surprised having seen the way a lot of people were just hammering on the machines with no idea of what they were supposed to be doing. 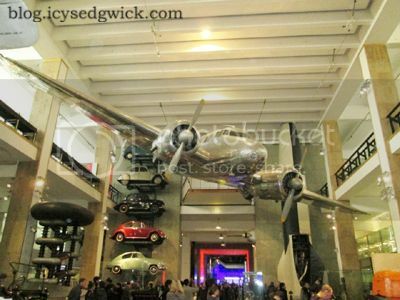 The Science Museum isn't my favourite of all of the museums in London but they do have some pretty cool stuff, and considering it's free entry, it's always worth a visit. 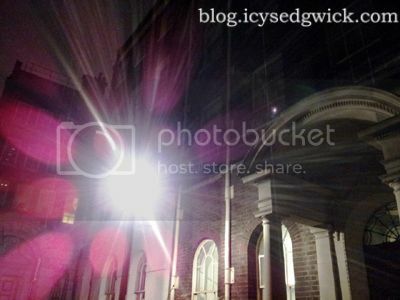 On Saturday night we headed off to the Bank of England to do a ghost walk around the alleyways of the City of London. 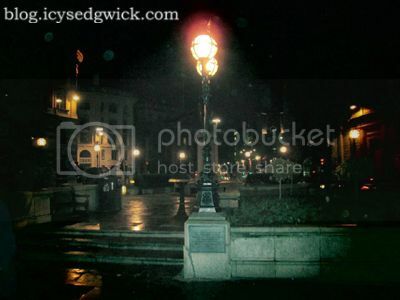 The photo on the left is the plaza outside the Royal Exchange. I used to work on the edge of the City, and the pub where I DJed is on Cannon Street, just along from the Bank of England, and I've always found the City to be a fascinating place. It's pretty much deserted after about 7pm, and it's surprisingly quiet on a weekend, and it's a place where the old brushes up against the new within the confines of the medieval City. Our guide led us down Birchin Lane and into Birchin Court, where we saw the alleged sight of Ebenezer Scrooge's counting house in A Christmas Carol. The streets in this area are very narrow, running between tall buildings and giving you a sense of what our fair capital must have looked like in Dickens' day...albeit without as much sewage and filth in the gutter. So many tiny pubs and other gems are tucked away down these alleys and in these back streets, and it often makes me wonder how people come across them, unless it's by accident. If that's the case, what else could you accidentally stumble across? 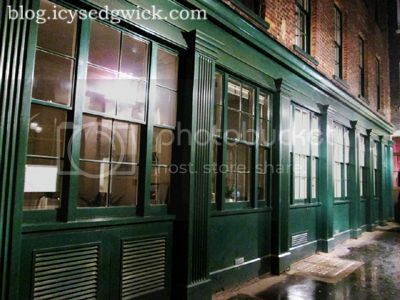 We ended up in Fredericks Place, off Old Jewry, which was the site of a story about the Cripplegate Ghost. According to our guide, Alice Gilliford was living in this court when she died, and she was laid out for burial in her wedding dress, wearing her wedding ring. The sexton of the church decided to make off with the ring before she was buried...except the wife came to life just as he dug his knife into her finger. 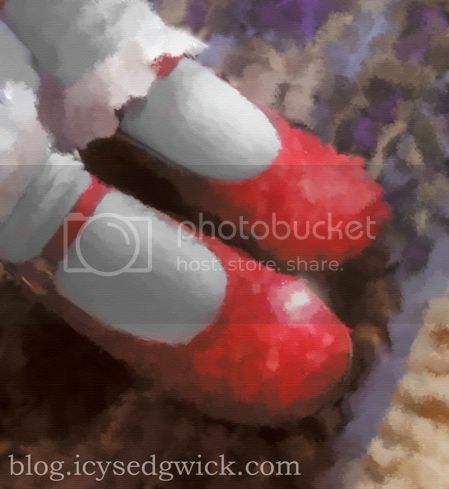 It turns out the woman was narcoleptic and was not dead, merely in a death-like coma, and the pain brought her round. She fled home through the streets carrying the lantern discarded by the terrified sexton, and became known as the Cripplegate Ghost even in her lifetime. She lived many more years and even had four more children before she finally passed away. The walk also took in Guildhall, a fabulous building on Gresham Street that is the home of the City of London Corporation. Built in the fifteenth century, it's one of the few remnants of medieval London, and it's now a Grade I listed building - it's the only stone built building not owned by the Church to survive the Great Fire of London in 1666. 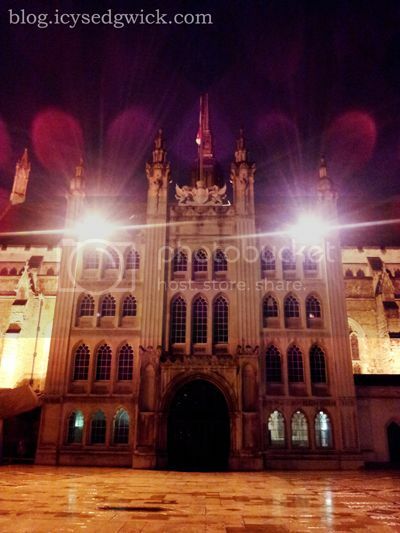 Lady Jane Grey, the famed Nine Days Queen, was tried here for treason in 1553. The façade is beautiful enough on its own but what is perhaps more interesting is the fact that Guildhall stands on the site of Londinium's Roman ampitheatre. You can see the remains of the eastern approach to the arena if you descend into the basement below Guildhall Art Gallery, something I did a couple of years ago when I was in the area. Coming from the north east where we have Roman ruins aplenty, I'm never particularly phased by seeing them elsewhere, but I have to admit, seeing part of an amphitheatre is still rather impressive! Thing is, the area still feels thick with something, as those who fought and died in the arena haven't quite managed to pass on. It's definitely a very weird place, and the combination of a fairytale frontage and a Roman amphitheatre make Guildhall a great place to visit. 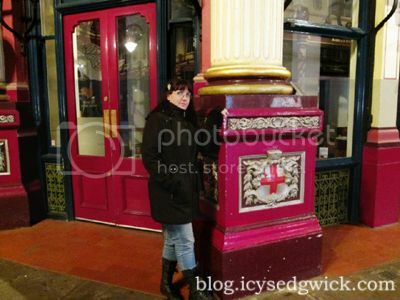 After the tour, we took a walk across to Leadenhall Market on Gracechurch Street. The market site dates back to the 14th century, providing another link to London's medieval past, and was originally a game, poultry and meat market. Now it sells all sorts and is even home to aPizza Express and Ben's Cookies. The current design dates to 1881, and has appeared as Diagon Alley in Harry Potter, and was also used in The Imaginarium of Dr Parnassus. It was restored in 1991 and is now a Grade II listed building. I've been in before, a few years ago at Christmas, but the only time I think you can really appreciate it is actually at night when it's deserted. Here's me posing by one of the pillars. 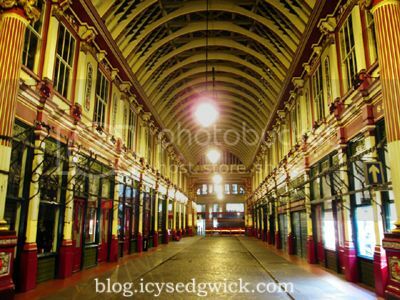 I absolutely love Leadenhall Market, and I've got a bit of a thing about covered markets. They're just such a good idea, and the fact that they're covered gives them a feeling of permanence denied to regular markets. We used to have two covered markets in Newcastle, but the Green Market was turned into an extension for the main shopping centre, leaving just the Grainger Market, which has seen something of a regeneration in recent years. Places like Leadenhall Market become tourist attractions, not to mention fashionable, and it's an easy way to preserve little slices of history. After Leadenhall Market we took a ride in the lift up to the roof of One New Change, the shopping and restaurant complex beside St Paul's Cathedral. Our ghost walk guide told us that one of the planning conditions for the complex was a viewing area, so they decided to use the roof, giving you amazing views of the Cathedral, and across the river to the likes of the Shard. I absolutely love St Paul's, designed by Christopher Wren after the previous cathedral was gutted during the Fire. Due to the cost of entry, I've never actually been in, but one of the days, I will have a look inside. 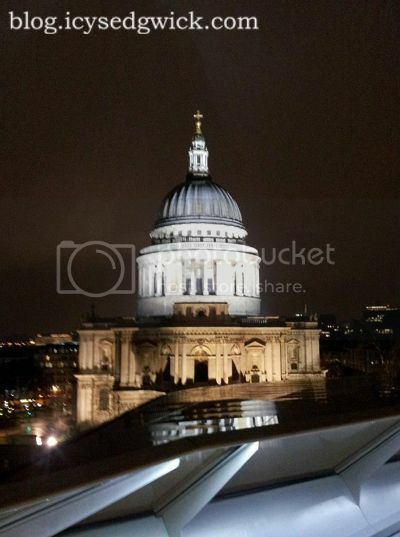 Anyway, it was dark and very windy when we went up onto the roof of One New Change, and it was also raining, but I'm sure the view is astounding on a clear day. The hour was growing late and the weather increasingly wild so we headed back to west London, and a truly horrendous late night trip to Tesco Express. If the zombie apocalypse had broken out, I don't think we would have noticed the difference. Last week I blogged about the move by Google to ditch Google Reader. I explained how I was looking for an alternative, and I was trialling Feedly, both on a desktop computer and on my Android phone. One of the reasons I chose Feedly was because it works as an extension through Chrome, whereas some of the other readers I looked at either charged a fee for a certain number of subscriptions, or others required you to download software and run the feeder through your machine. I access RSS readers on various machines, as well as my phone, so I needed something that worked across several platforms. In addition, Feedly allows you to log in to your Google Reader account so all of your subscriptions are already there, waiting for you to browse. I subscribe to over 200 blogs so any service which doesn't allow me to import those (Skimr had real problems with that) is already onto a losing wicket. At first, I hated it. Feedly seems to prefer to display content by the date posted, assuming that you come back and read all of your outstanding posts on a daily basis. I prefer Google Reader's layout, letting you scroll by title and then browsing the titles of unread posts within each blog. I don't always get the chance to read every day, so a time-orientated layout is never going to suit me. However, I decided to persevere, and I spent a little time during the week tinkering with my settings through the desktop version (these changes sync with the app version so whatever I do on my computer is reflected on my phone). I've set up categories, and dragged each blog I subscribe to into one of them, meaning I can quickly browse just those blogs related to writing, or history, or design etc., depending on what I want to read at the time. Even better, I could never read those blogs I subscribe to through Blogger in the Reader on my phone, but Feedly makes it easier to add them to my existing categories, meaning I can now read them on my phone too. Just this one little change has really affected how much I use Feedly. I now find myself checking Feedly more often, and reading more posts that I did. Its inclusion of thumbnails with each post title makes it far more visually appealing than Google Reader ever was, and while nothing can top Google Reader for raw efficiency, Feedly is certainly impressing me enough that I have no real need to try any of the other readers. Has anyone else given Feedly a go?